Michele de Luca began his stem cell research career working in Boston in the 80s, after training as an endocrinologist. Alongside Professor Howard Green he worked with epithelial stem cells for the treatment of patients with burns to the skin, before moving back to Italy. 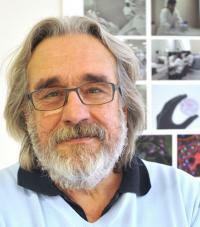 He is director of the Centre for Regenerative Medicine "Stefano Ferrari" at the University of Modena and Reggio Emilia. Throughout the years following he has collaborated with many different people, but most significantly Graziella Pellegrini. Their most recent achievement is the EMA approval of Holoclar®, Europe’s first, approved, stem cell therapy for cornea damage. What is your main research area? I work primarily with epithelial cells. 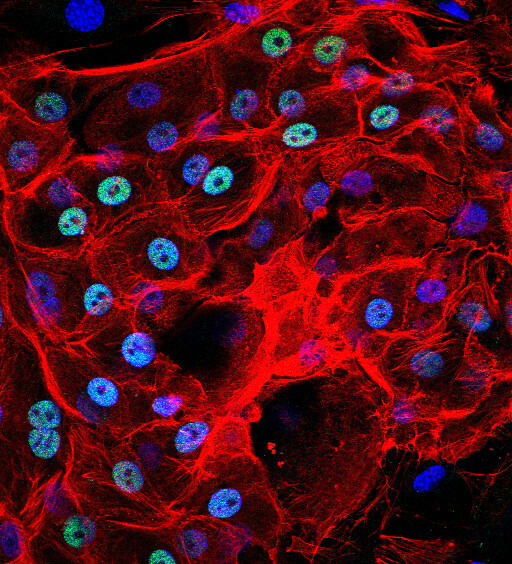 Initially working on skin epithelial cells I then got interested in the eyes. Right now we are working on restoring sight in patients who have had damage to their corneas from physical and chemical burns. This has been a long project, with about 20 years of initial research and pre-clinical trials. Holoclar®, perhaps our most successful project, involves using limbal stem cells, taken from the eye of a patient, to re-grow a healthy corneal epithelium. This can then be transplanted into the patient’s eye. The advantage of this method is that the cornea is made of the patient’s own cells, preventing rejection. Holoclar® has now been approved for use throughout Europe. What does the approval of Holoclar® mean for regenerative medicine in Europe? It means a lot for regenerative medicine as a whole. It tells you that you cannot wake up one day and decide to make a product from stem cells. There are years of work involved and contributions from various experts that go into the research of this type of therapy. It also sets a bar for others, it says that this is the way that regenerative medicine should be practised in order to produce a therapy that works safely and successfully. What defines Holoclar® as Europe’s first stem cell-based ATMP (Advanced Therapy Medicinal Product)? Holoclar® can be called the ‘first stem cell product’ because it is based not on cell culture as such, but on the role of the stem cells contained in that. We have a very precise and controlled numerical range of stem cells needed in the graft in order for the culture to be a success. Holoclar® is specifically aimed at replacing stem cells that are lost in the damaged eye. These stem cells have been thoroughly characterised at the molecular level and, once engrafted, are solely responsible for the long term regeneration of a functional corneal epithelium. The precise nature of this research and the positive results we produced are the reasons behind its approval for use throughout Europe. What collaborations have been important in bringing this therapy forward? Collaborations are crucial in the entire field of regenerative medicine. It is probably one of the few fields where there isn’t just one person working alone, without having experts from different fields it wouldn’t progress. Graziella and I were the stem cell experts, in this case, but we needed expert clinicians to work alongside us. The clinicians need to adapt to working with these new stem cells. The cells are alive, changing and growing; like children; and such a close working relationship, between the clinicians and our team, it would be harder to adapt. Paolo Rama is the clinical ophthalmologist for Holoclar® and we have worked closely with him to develop this therapy. Also, without the pharmaceutical companies, Andrea Chiesi in particular, we would not have the backing to progress with the research. They were principal in guiding us through the regulation and process of industrialisation of this therapy. Without everyone involved we would never have managed to get to this point of approval. Moving on from Holoclar®, what are your future research aspirations? Holostem Terapie Avanzate, our university spin-off, was never intended to be a single product company, so there is more to come from here on. Epithelial cells are always the main focus of our research at Holostem; therefore, we now have a few other projects to focus on. Rebuilding the urethra following trauma and the build up of scar tissue within the urethra is one of those projects. Another is moving directly on from Holoclar®, looking at people who have genetic diseases which causes blindness or total bilateral limbal stem cell deficiency. These people are unsuitable for Holoclar® as, in some cases; there are no limbal stem cells available for the therapy. These are at currently in the very early stages, known as the basic pre-clinical level of research. My main aspiration for the future of Holostem is gene therapy. The moment you know a stem cell well enough, you know how it works and can apply it in a cell therapy setting, you are able to think about the genetics and how they could be modified to take care of genetic diseases. Our main genetic disease focus is epidermolysis bullosa, a debilitating condition in which the skin blisters and parts from the body, somewhat similar to that of a burns patient. We performed a phase one clinical trial, using genetically modified epidermal stem cells and saw some encouraging results, curing two legs of a patient with this condition and one leg of another patient suffering from a similar disease. The next step with this is to implement phase one and phase two clinical trials using genetically modified epidermal cells, a collaboration between the team here in Italy and the dermatology department in Salzburg, Austria. We are trying to repeat the same path we did with Holoclar®, in order to have this gene therapy available for those affected. That’s my dream before I retire. Finally, what advice would you give a scientist starting out in the field today? I trained as an endocrinologist and only once I was doing the job realised it wasn’t for me. I wanted to be doing scientific research. So, I’d say if you are really passionate about something you just have to go and do it. As long as you practice to the best of your abilities, try to improve knowledge of your field and maybe, even help people with your work, you’re doing very well. However, it is frustrating. Most of what you will do won’t work, or will need another experiment to explain the first one. This is the beauty and the frustration of science and being a scientist. You have to be tough and you have to be patient. If you can manage that, you’ll be successful. All it takes for you to appreciate all the hard work you have done is one big discovery. However, it may take 5 or 10 years of hard work to get there. In terms of Holoclar®, the first time Graziella and I saw a cloudy eye clear up we knew it was so worth it.